When I started this blog, Keyn was 2 years old, therefore I wasn’t really posted anything about how I gave birth to him (in detail). So now that I have Selene, I could share it to you guys! Nobody knew this before, but yeah, you can keep a secret right? HAHAHA! I told them (friends and family) that I didn’t know that I was in labor before going to the hospital. But it was a white lie? I don’t know but I wasn’t very honest with it. I think I was in labor a day before (April 11, 2018). I don’t know but I have frequent contraction from noon until night. I observed myself of course. The contraction was gone around 10 P.M. I told to myself that I’m going to the hospital the next day for my weekly appointment (I was close to my due so my OB and I have weekly appointment. Plus I missed my appointment that week before) So I just have to wait, plus I would ask her if she help me to not be in labor for one more week because Kenneth’s arrival was next week. So I told myself, relax and stay put. I told my baby to not be excited. We want to have his daddy when she’s born. But my baby’s a little bit excited. Around 5 in the morning, I woke up because I needed to pee and of course I have contractions. I went back to sleep again because it was too early. Around 6 am, I woke up again to pee. Again, I went back to sleep. Around 6:30, I woke up again to pee. I know, I was in labor. Since, I’m going to see my OB that time, I didn’t panic. I talked to Kenneth that I will wait for him (As if I could hold it myself right?) Around 7:30, I felt that it became intense. My lower abdomen hurt a lot and I knew, I am really in labor. I packed (because during my pregnancy I was too lazy to pack) my things, clothes, important documents and all. I texted my mother that I’m going to give birth. (“Ma, manganganak na ata ako” that was my exact text) I showered (Because I have lots of time! Chos!) I changed my son’s clothes because she’s going with us. And waited for my father. Around 8:30 we’re ready and we’re going to the hospital. and I was intensely in labor (if there was such a word). I know that I might give birth inside the car but I told myself and my kid that “no! we needed to give birth in the hospital! Keyn told me that I should sleep to not feel the pain (How sweet right?!). Around 9:00 we arrived in the hospital. My father went to the lobby and not in the emergency room so the guard gave me a wheelchair and pushed me (he was running, mind you!) to the emergency room. My water broke when we arrived in the ER, but unfortunately we needed to be on the 3rd floor, where the OB complex was located. The nurses told me that I should stay put and to not push because it was not safe to give birth inside the elevator. When we arrived at the OB complex. They help me removed my clothes and to change into a hospital gown. They brought me inside the delivery room. While in labor, they ask me to fill out the forms, good thing that I could write fast enough because I finished it in no time. We waited for my OB to arrived and while waiting during contractions, a nurse or a doctor will insert his/her finger to prevent my baby to come out. I asked them frequently if I could have anesthesia, unfortunately it was too late for me to have one. My OB arrived around 9:30 A.M. Good thing that she was in the parking lot of the hospital that day. I gave birth around 9:35 A.M. with a 2.35 kg baby girl. I gave birth without an epidural anesthesia and it was hell. Good thing I could take it. (I had an epidural anesthesia when I gave birth to Keyn) I could feel the needle when they are seaming my wound. But of course I could only feel happiness because Selene’s healthy. 5 minutes of pain for a lifetime of happiness. I slept when I saw my baby and woke up in the recovery room around 10:30 to 11 A.M.
Around 11:30 or so, they brought me inside our room. I asked my phone to mama so I could inform Kenneth’s family and others that I already gave birth. After a while, Selene was brought to our room. I was high with happiness. Here are some of the pictures that day! Enjoy! We stayed at the hospital for 3 days. My kuya keyn’s been a good kuya from day 1. It was hard being a mother of two but it’s all worth it. Here’s Selene when she was a month old or so. Giving birth is really hard but it was all worth it. When Facebook reached the Philippines at 2009, it was really a hit. It was like 90’s kid with friendster but even better. Social Media became a thing. I’m not saying that social media wasn’t a thing before 2009 but it became trendy. Twitter became a new found platform to rant, facebook became a way to communicate to other people, instagram became a platform to brag. It was a good thing at first. It really was. 9 years after of the social media became something else, was it still good? Facebooking while eating with family. Chatting on messenger while with friends. They say that, social media made it easy for others to communicate with relatives and friends who are far from us. But it also made us less more social. We prefer to talk to those who are far from us rather than talk to the one beside us. Social Media made us become a self-entitled human being. It wasn’t bad actually, knowing your worth, but when the self-entitlement is too much that it became arrogant, I don’t think it was okay. Social Media also became the way to define someone’s successes. I am one of those who are ashamed of what I become, like, why did he or she traveled a lot? Why am I still stuck here? Why am I such a loser? Those are my thoughts before. (Before I started this blog) Those are the other reasons of my depression. Social media also became our platform to embarrassed others, to make them feel nothing when in fact we don’t know anything. We thought that some posts on the internet were real. When in fact it weren’t. We tend to judge someone else’s life easily when we really know nothing. We call it freedom of speech, I called it something else. Freedom of speech has a responsibilities as well as consequences. Some says that “We have freedom of speech, so we will say what’s on our mind”. Really though? For me, freedom of speech has responsibilities and consequences, first is to think before you click. Think before you share. Think before you post something on the internet. Always think and balance everything else, Is it true? Will someone get hurt? Will this beneficial to others? There’s nothing wrong in sharing news and all over the internet. It was fine but I think it shouldn’t be biased. It should be well thought and it shouldn’t be over a meme. It sadden me actually, when someone’s sharing something over facebook that I think it wasn’t well thought or a fake news. So why I entitled this blog “Unplugging”? Because it was nice to unplug once in a while. It was nice to be over on something that is toxic. Yes social media is toxic. It wasn’t healthy. Social media became our basis of someone else’s life. It became the basis of someone’s wealth and someone’s achievement. Sometimes it is good to unplug from the world and escape this toxic world. I really want to unplugged. So while writing this blog and researching for the right terms to use, I encountered this website. Did you know that there this National Day of Unplugging? Well, now you know so am I. National Day of Unplugging is on March 1-2, a 24 hour event. So yeah, I am joining. It was really good to unplug to reconnect right? I started blogging way back 2013, because of this I overcome my depression. I love how I share my thoughts, my reviews and my point of view in life. But it saddens me to see that my favorite bloggers are not active on blogging anymore. I know, I am inconsistently updating my blog before but I’m trying to change it by writing one blog per day. I haven’t checked my favorite bloggers for a while now but back then, when I checked their websites, I am glad that they are new updates. But, when I checked their websites now, there are not that active anymore. I don’t mind that they are turning into vlogging because you see, it became a thing. Technology is always changing and I think it is time for youtube to be one of the top social networking platform if not the top but I think to abandon something you love first hand was a little bit disappointing. I am not judging those bloggers who prioritized vlogging. I just want to share my sentiments about this. Seeing them active on youtube but not as active on their websites. I mean, some people still reads you know. They still prefer to read rather than watching. I do vlog. I have videos on my youtube chanel but I don’t abandon the thing that helped me survived my darker days. But I do understand them, editing videos is taking a lot of time than writing a blog. I thought that vlogging is much easier because you just have to be yourself and talk. But well, there’s this editing part which made my head ache all the time. I can write 2-3 blogs a day but I can’t edit 2-3 vlogs in one day. Checking how your videos should turn out over and over again. Once you render your video, you will still watch it for the nth time just to be sure that your vlog was flawless. You have to download lots of musics with no copyright because youtube might take your videos down. You have to find a good special effects for your vlog to be unique or to stand out from the rest. You know, I understand them. But still, I wished that they won’t abandon their first love. As for me, writing is my comfort zone so I won’t abandon it. You see, I write for myself, my readers (if there’s any) are just a bonus. The main reason why I made a blog is for me to cope up with my depression and insecurities. Here’s me when we were in Quezon which I will be posting here soon! This happened last January 2016, we decided to hang out here after dinner. I honestly forgot what happened that time and what are the tastes of their food and shakes. I just know that, there are better shakes out there to try. But since it was an impulsive decision and another time to spent with them and I think it was worth it. Crepe Amelie is located at the ground floor of A Venue Mall. The crews were nice plus they don’t mind that we were a little bit (or super) loud! Hahahaha! The store was cute. I like how they write the calligraphy. It was really nice. The place was clean too. I don’t know what we ordered but I think it was a caffeinated shake. Plus I love that they serve the shake in mason jar. Love mother nature right? Hahahaha! I really want to write a review about my experiences on various online shops. I had been an online shopper for quite some time now and would like to help other online shoppers on shops that they should trust or not. But since I can’t seem find time to gather all my previous transactions, I decided to just review one at a time. Last year, as I’m looking for Christmas gifts for #thesquadro, I came up with the idea of having a personalized passport holders since last 2016, I gave them overnight travel bags since we love to travel together, I think it was a good idea. After having thoughts and mind discussion (is there such a thing? hahaha!) I decided to give them personalized passport holder. After thorough inquiries to various online shops, I decided to buy at Oh! Travel Basic PH. I know, I had faults here because I just placed my orders around December 19, 2018. But in my defense, according to their post, their cut off was every Tuesday and it will be shipped the next day. As I checked my calendar, yeah! I said, pasok! I paid before 10 pm as they instructed. I waited and waited. I followed up through out the week. I figured after 3 days of following up that my package will not be delivered on time and we were leaving Manila around December 23, 2017. So I decided to buy another gifts for them. I gave them same travel pouches but in different colors. I didn’t cancel the transaction, I didn’t ask for a refund, I just patiently waiting in the dark because they didn’t update me about my items. I received a text from them last December 23, 2017 that the item was ready for pick up. Since I chose it to be picked up during the time of ordering since I think I could easily get it on time. But I was wrong. It was ready for pick up last December 23, 2017 but I was already in Pangasinan going to Baguio (where we celebrate our Christmas) So I told them I couldn’t. They told me that their meet up schedule will resume on December 26, 2017. I told them to inform me what time on December 26. So the day came, I waited for their message. I asked them the time. They replied last December 30 if I could pick it up the same day, unfortunately, I read their text last December 31. January 6, 2018 came, I told them I want them to shipped the item and made the deposit on January 18, 2018. I received the items last January 26, 2018. You may think our transaction was completed. Nope! Because they misspelled my sister’s name on the passport holder. I checked my texts if I sent them correct names and I did. I told them that they misspelled it the day after I received the items. I got a text from them last February 1, 2018, asking me if when I could pick up the item. To make it short, I haven’t got the item. I told them I would like it to be shipped and I will shipped the item I have. Unfortunately, it was the time they decided to go offline and we don’t know when are they going to be online again. They even disabled or uninstalled their viber account. I don’t know why they couldn’t give it to me when in fact, they made a new one for my sister. I guess they couldn’t fixed their issues with other clients before going MIA. So yeah, I haven’t heard from them ever since, and I still haven’t got my passport holder. Even though they have nice reviews you’ll never know what will happen until it will happen to you. Unfriending a friend is really difficult. You’ll think of all your memories with that person. You see, for me there’s this unintentional unfriending and there’s this intentional unfriending. Unintentional unfriending is when you and your friend grew apart. From the word unintentional meaning, you didn’t do it on purpose, it just happened. Intentional unfriending is you have a reason why you unfriend him or her. I mean you do it on purpose. Be it because you two had a fight or what but you definitely knew that he or she will not be your friend anymore. You see, life is really fair but the circumstances were not. Life is being complicated by you and by the people around you. In this toxic world, to not be stressed, you have to cut everything that could stress you. I’m not saying it is easy but I think it should be done. You’ll know when you need a friend to unfriend. When she or he became toxic, if you gave him or her all the chances he or she could get but always blew the chance. You’re not on the same page anymore. When you think you’re the only one who treasures your friendship. Friendship is a give and take relationship. It is more than being in a relationship (when a girl is always right even if she is wrong XD). When you think she did something bad to you, you’ll forgive him or her and like versa. It is not a give and give relationship where you’re the only one who is doing the giving part. Forgiving him or her, giving him or her your time, lending your ears, giving yourself. Friendship is not like that. Friendship should be a two-way relationship and not one. Did someone unfriended me? Yes, and I’ve been living with it ever since. The what ifs. What if I shouldn’t be too sensitive? What if I became more forgiving, what if I didn’t get mad or what if I shouldn’t said what I said. All the what ifs but I always go down to: Is it worth it? The friendship, I mean? When every time you think of that person you only realized that you became too forgiving and too understanding when in fact it was your the only time you vent out? So yeah, the friendship isn’t worth regretting. Did I unfriend a friend? Of course it happened to me. I’ve been doing it for a long time. I had been unfriending friends for half of my life. You can easily gain my trust, yeah, but I could only give a few chances for you to gain it back, and when I am done. I am really done. You may say that I’m ruthless, who could do that right? But when you were fed up with everything she or he did to you, you can’t say that you are ruthless. You just know your worth. But don’t get me wrong okay? I am a very forgiving person. I don’t easily triggered by someone and I don’t easily cut someone’s out of my life. You really did something really bad to me for me to unfriend you. I have friends who used me. I have friends who became my friends because of what I could give them. What I could do right? I really like to have friends way back elementary to high school. Since I’ve been bullied a lot and a lot of my classmates don’t like me, I get what I could get. And that really hurts me this days; thinking about my younger self, being treated like that. I wanna say to her that “Girl, it’s not worth it. You should know better.” But what could I do, I crave for something. Who wouldn’t want to be accepted right? I became better when I was in college. I didn’t crave for someone’s attention, I realized that when a friend is really a friend to you, he or she will stay for who you are not for what you could give them. I treasure all of my friends when I was in college. I still get in touch with them from time to time. We still go out, we still communicate. But then, life happens and people change. You may not know it right away but you will. People won’t stay the same as you know them before. But it will be your choice if you will stick to them or not. I still have lots of friends, and I will forever be grateful for them. I believe that even if you lose some, you will also gain some. So it is up to you if you accept it or not. In time, I will lose friends but the girl beside me in this picture, she is my constant. No matter what happened she will remain as my constant. So yeah, Sorry for this lengthy post. I don’t know what’s gotten into me but I really like to write about this for quite some time now. February last year, we celebrate mama’s birthday in Baler. It was our first time in Baler so I’m really excited that time. Though I haven’t planned our itinerary because I thought we were going to surf and that’s it. Hahaha! So yeah, we arrived at the Balete Tree around 10 am or so. My kuya didn’t understand why this tree was a tourist spot. I don’t understand it either but you see, we considered a place a heritage site when it reaches a specific age but we never considered a tree to be something when in fact we should right? After less than hour from the Balete tree we reached our destination; Costa Pacifica. It was nice actually. They have big swimming pool and a small swimming pool for kids. And a few feets away from the shore. We waited for a bit since we were not allowed to check in yet since it was too early, we relaxed beside the swimming pool because lounges inside the lobby are all occupied. I can’t find the picture of their lobby but it was really nice. When we were allowed to check in, we had to walk a little bit far (I think) because we rented two rooms in Casita de Bahia. It was nice and secluded but 250 meters away from the shore so if we want to go to the beach, we have to walk for like 5-10 minutes. We had 2 bungalow type rooms with two beds. The only thing that is bothersome with the room was mosquitoes but other than that, it was nice. We had to wait for my Tita to arrived before we enjoyed Baler, we ate lunch somewhere I forgot and ate dinner somewhere I forgot too. Hahaha! We really like to dine here in Baler Surfer Grill, unfortunately, it was closed that time. After dinner, we settled outside our room to relaxed and drink. Unfortunately, we couldn’t talk and laugh loud because it was an open area and there are guests in the other rooms but we enjoyed nevertheless. I’m really sorry that I haven’t really tell what happened that time since it happened a year ago but, our first day in Baler wasn’t eventful at all. Wait for our Day 2 in Baler. Day 2 was when I learned how to surf so yeah, stay updated! A programmer who needs an escape from her reality when the world is against her. 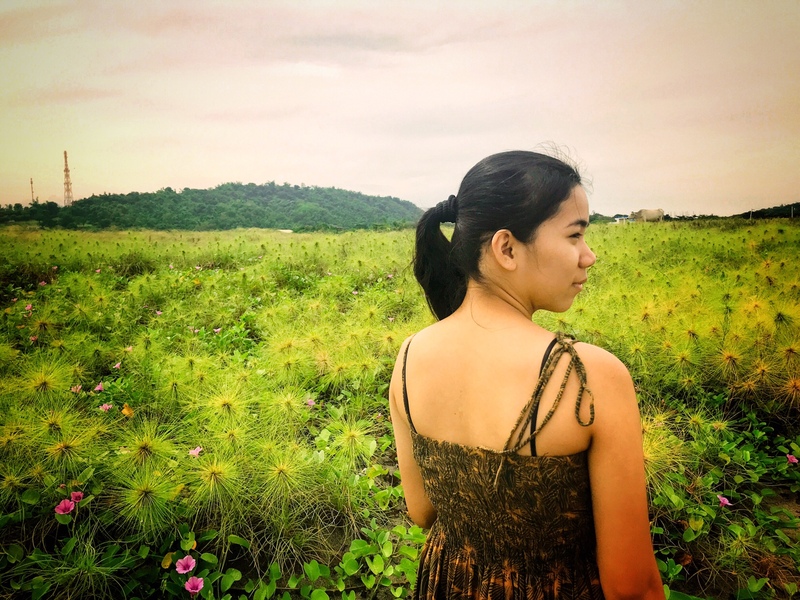 My Sweetest Escape by Sidney Buenaventura is a personal blog about fashion, travel, food, motherhood and everything in between.